Meethi Seviyan, an authentic Indian dessert recipe is usually made on festivals. 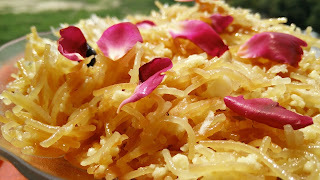 Meethi Seviyan or Sweet Vermicelli can be made with or without milk. Even the consistency can be dry to pouring. Generally milk gives the richness to the vermicelli. We have brought out a variation in the standard milk recipe where in we are using curdled milk. 1. In a Kadai or non stick pan, melt ghee and put vermicelli. Saute vermicelli till it turns brown. 2. Once brown, add milk and cream. Cook till milk comes to boil. As milk starts boiling, add lemon juice which will curdle the milk (just like paneer or cheese comes out of milk). Soon cheese and water will separate and at this point add sugar. Cook the mixture till all the water dries up. 3. Switch off the flame and allow meethi seviyan to cool down. As it cools, the stickiness will be removed and will give rich and a very nice texture. Dry fruits can be added now or can be added as garnish as well. 4. Serve hot or cold as per liking.